Daniel Miller (Albert Brooks) accidentally dies in a car crash and is whisked away to Judgment City, where the recently dead are put on a trial to decide their fate. If in your time on Earth you were able to learn from your mistakes, you get to move on to a life in a better world. However, if you didn't, you have to go back to Earth and try again. As he spends the next days watching various episodes from his life, Daniel gets the impression he doesn't stand much of a chance of moving on. In the meantime, he meets and falls in love with Julia (Meryl Streep), but what's going to happen if they don't end up in the same place? Multi-talent Albert Brooks wrote and directed "Defending Your Life" and teams up with a distinguished ensemble cast. Included are Meryl Streep, as the woman of his dreams - or anybody's dreams � Rip Torn, Academy Award-winning actress Lee Grant and Buck Henry. The cast takes us through an entirely new look at the afterlife. No angels, no harps, no wings. Rather, judges, defenders and prosecutors, all there to get you through the process of Defending Your Life. While critics responded to the offbeat premise and the surprising chemistry between Brooks and Meryl Streep as his post-death love interest, the film was not a hit financially, grossing about $16 million in the United States. The Hall of Past Lives is actually the old Fluor Daniel building in Irvine, California. And look out for a cameo of Shirley MacLaine as herself - acting as the holographic host of the "Past Lives Pavilion" (a reference to her publicly known belief in reincarnation). 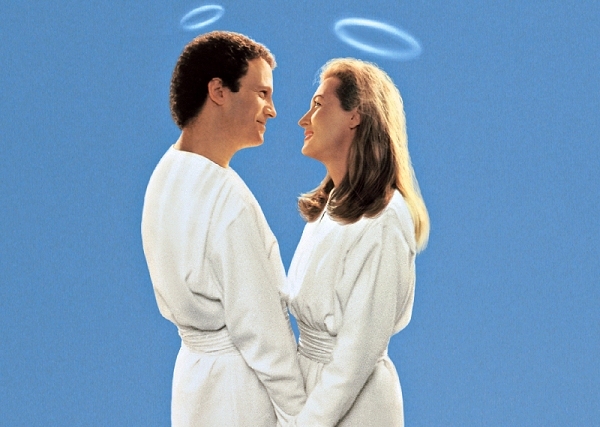 "Defending Your Life" has been a triple task for Albert Brooks, who wrote, directed and starred in this comedy. The premise sounds fun - the afterlife is a place called "Judgement City" where lawyers review your life - your goals and mistakes - to see if you're candidate for heaven or hell. For Brooks, as a famed stand-up comedian, the courtroom scenes offer enough room for funny dialogue. And here where's my trouble with the film begins. Instead of good dialogue, most of the film consists of a variety of punch lines, wise cracks and jokes that sometimes go nowhere. The idea of having your life in court fades as well since most of it repeats and you wonder how many discouraging scenes of his life Daniel has to see as well. The bright light of the film, literally, is Meryl's Julia. She's seen as the perfect woman, who has had the perfect life, and won't be having any trouble getting to heaven. Daniel falls in love with her, probably because she laughs hysterically at all of his jokes (in contrast to the watching audience), for him even hell would be heaven if he could spend this time with Julia. While their scenes are funny, there isn't anything to do for Meryl. She simply plays "the girl". The last time she did this, in "The Deer Hunter", she was given free hand to create a fully fleshed character out of an underwritten role. Here, it doesn't happen and at times you wonder why Meryl has taken this role. Maybe out of admiration for Brooks. Maybe she was bored. Maybe both. At least, the film works as a romantic comedy, so if you enjoy this type of film, you'll like "Defending Your Life". 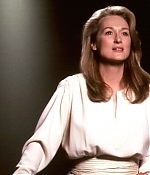 The Complete Works | Explore each of Meryl Streep's feature films, theatre productions and tv appearances with Simply Streep's comprehensive timeline. Alternatively, you can browse all productions through the categories below.